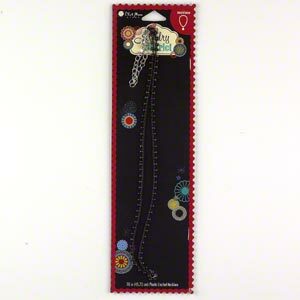 Necklace, Blue Moon Beads®, glass, black, 3x2mm rondelle on cotton thread with silver-plated pewter (tin-based alloy) lobster claw clasp and 3-inch steel extender chain, 18 inches. Sold individually. 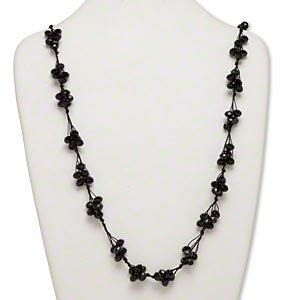 Necklace, glass and nylon cord, black, 8x6mm faceted rondelle, 32-inch continuous loop. Sold individually. 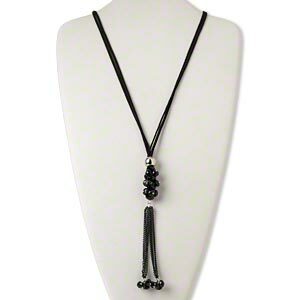 Necklace, 2-strand, silk / glass/ imitation rhodium-finished "pewter" (zinc-based alloy) steel / brass, black / clear / grey, 4-1/2 inch dangle, 18 inches with lobster claw clasp. Sold individually. 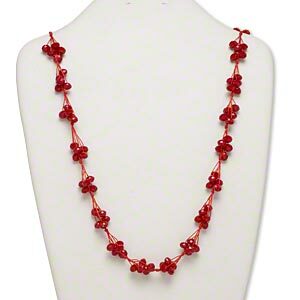 Necklace, glass and nylon cord, red, 8x6mm faceted rondelle, 32-inch continuous loop. Sold individually. 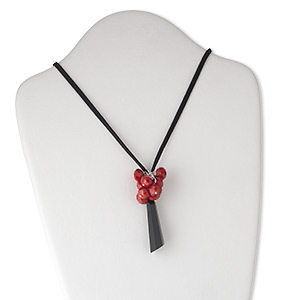 Necklace, 2-strand, velvet cord / steel / glass / silver-coated plastic, black and red, 8x6mm faceted rondelle with 6-inch dangle, 32 inches with knotted end. Sold individually. 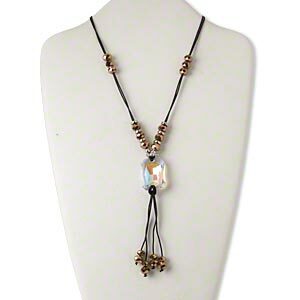 Necklace, glass / silver-coated plastic / plastic / silver-finished steel / nylon cord, black / clear AB / metallic bronze, 33x24mm faceted rectangle, 30-34 inches with lobster claw clasp and 2-inch extender chain. Sold individually. 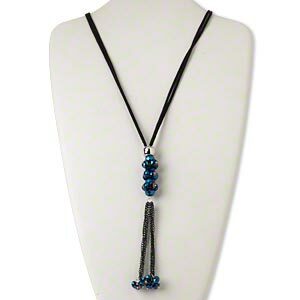 Necklace, 2-strand, velvet cord / steel / glass / silver-coated plastic, black and metallic blue, 8x6mm faceted rondelle with 6-inch dangle, 32 inches with knotted end. Sold individually. 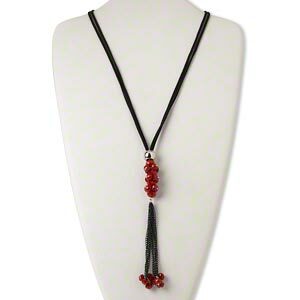 Necklace, 2-strand, velvet cord / steel / glass / silver-coated plastic, black, 8x6mm faceted rondelle with 6-inch dangle, 32 inches with knotted end. Sold individually. 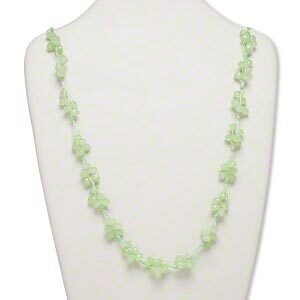 Necklace, glass and nylon cord, light green, 8x6mm faceted rondelle, 32-inch continuous loop. Sold individually. 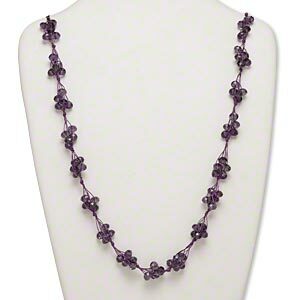 Necklace, glass and nylon cord, purple, 8x6mm faceted rondelle, 32-inch continuous loop. Sold individually.